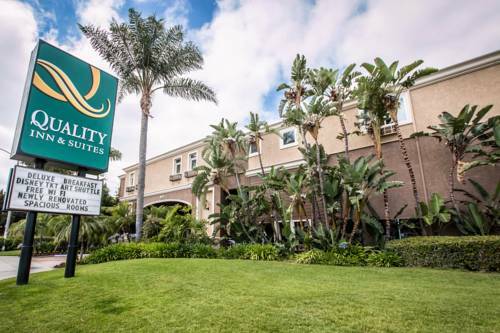 When corporate travel sends you to the heart of Orange County, you can get more for your money when you stay at the Quality Inn & Suites Anaheim Maingate, CA. Our hotel is located just beyond the entrance to the Disneyland Resort, and near the Anaheim Convention Center Arena. The John Wayne Airport is less than 10 miles away. Our hotel amenities include free WiFi, free hot breakfast and an outdoor pool. All guestrooms feature coffee makers, hair dryers and safes. Family suites can accommodate up to eight people, and deluxe rooms with a hot tubs are available, too. Also, earn rewards including free nights and gift cards with our Choice Privileges Rewards program. Discount attraction tickets and tour packages are also available. Resort Fee: $5.00 plus 15% tax per room per night. Parking fee is 5.00 USD plus tax per day.